ESP32 powered LED matrix displaying real-time news, weather, stock, date, time, barometer data, menu and web interface with notification. After my previous project (Arduino 32x8 LED Matrix Info Display displaying date, time, temperature, humidity) I thought it would be interesting to build a more dynamic display which connects to the internet and can retrieve data from various websites. 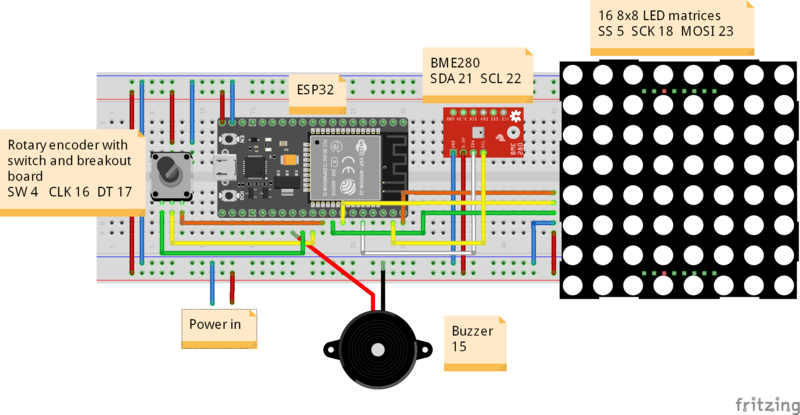 The message board is built with an ESP32 microcontroller, 16 8x8 LED matrices, a temperature/humidity sensor and a rotary encoder to control what is displayed. The LED matrices are devided into 3 zones: time, alternating date and barometer info and the main message display. The Parola library is used for displaying the messages. After powering up, the ESP32 connects to the local wifi network and a timeserver to get the local date and time and determines if Daylight Saving Time is active or not. Then it loops through the main carousel, displaying full date, sunrise/sunset times for a city, current weather and forecast for several cities from Openweathermap.org, news headline feeds from Newsapi.org and stock data from www.alphavantage.co. The rotary controller lets you select several menu items for chosing what to display: the main carousel, several news categories or stock data. It is pretty basic, I intend to extend it in the future with submenus, etc. The script can be localized and adjusted to display information from other cities, other websites or other sources. The LED matrices are daisy chained (soldered 2 by 2) and connected to the ESP32. I used tape and pieces of cardboard on the back to keep the modules together. Because of the large number (1024) of LEDs, the projects needs to be powered by an external power supply, preferably 2A or higher. I do not recommend powering it by USB through the ESP32, the power the LEDs will draw is (much) higher than the ESP32 is designed to handle. Tip: I would recommend not daisy chaining the power connections of the MAX7219 4 LED modules but connecting each one directly because there is a slight power drop after each module. It is noticeable when you power all 1024 LEDs at once, not so much with normal use. A look at the inside. Still with the breadboard, it will be soldered later. The code consists of the main code file, 2 font data files (from Parola library examples) and 7 libraries. The code files and links are in the Code section. The libraries have to be installed in the Arduino IDE (I used version 1.8.7) and the 2 font files have to be copied to the same folder as the main code file. To adjust the code for your setup: search for the @EB-setup comments. Search for the @EB-share comments to change default settings to your preferences. Note: click the 'Download' button and not the 'Copy' or the code may be truncated and not work correctly! Added support for conversion from UTF-8 characters to extended ASCII codes (according to ISO-Latin-1). Added a web interface for displaying custom messages and with several controls. I added a buzzer to get an audible notification when a new message is received from the web interface. On a suggestion of user PT I added light sensor support, it will set the brightness of the leds (the Parola library) according to the light hitting the sensor. Note: using Wifi on the ESP32 causes problems with analog reading on some GPIO pins, I used pin 36. I also added a Youtube counter, clickable links for Newsapi and Wikipedia articles (for the web server), a delay corresponding to the Newsapi maximum requests of 1000 per day (for the free plan) and some other enhancements. Feel free to use the code for your personal use, not for commercial purposes. You can contact me at ericBcreator@gmail.com. NewsApi.org, stock data from Alpha Vantage and random Wikipedia items. a new message is received. This code is free for personal use, not for commercial purposes. Please leave this header intact. and stock data from Alpha Vantage.